You Are Here: Home » TLC Blog » Revealing WordPress Hosting Review: It’s Your Lucky Day! 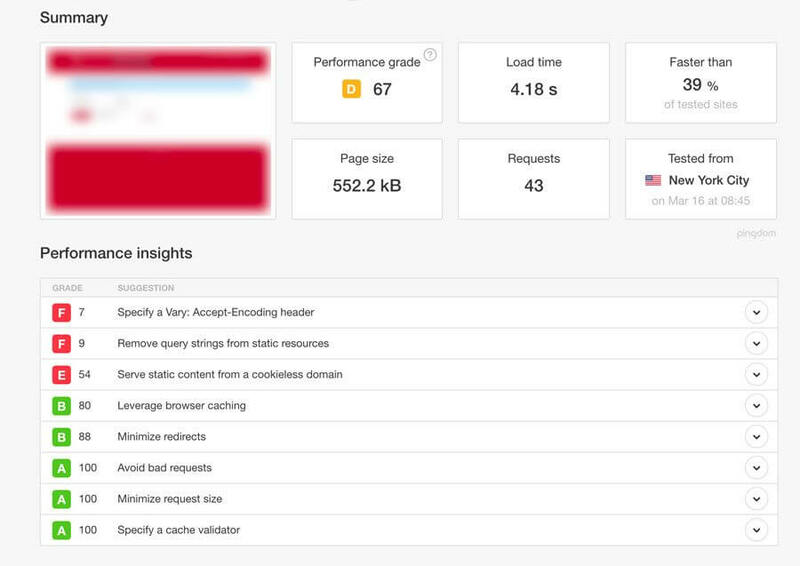 Recently I wrote about website speed and performance for WordPress websites. 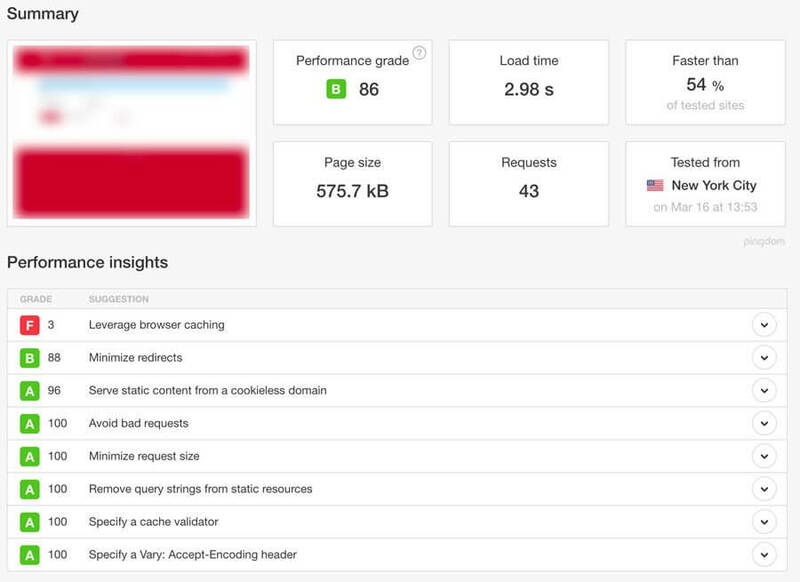 I found that the quality of hosting plays a big role in the performance of a website, and how fast it loads. As I mentioned in my previous post, testing tools can be inconsistent and different tools have different benchmarks and matrices. My preferred tool is Pingdom Speed Test (free), because it usually gives the most positive results and is fairly simplified. To get a good overview of the difference hosting can make, I tested the same website on 4 different hosts. The website has a very simple, small homepage, 13 plugins, one of which is an LMS. There are 173 Lessons/Posts in the LMS, so there is a fair amount of content. Disclaimer: Since this is a test site, it does not have any traffic, so this should be considered when reviewing the results, but the content of each site is exactly the same. Also, in full disclosure, affiliate links are included below. GoDaddy has a spotty reputation in the hosting world (that may be putting it a bit mildly). I only started using GoDaddy a couple of years ago, when they were “rebuilding” under new management. I have had only good things to say about GoDaddy … until recently. A key for me for any hosting company is support. It’s a deal breaker for me if I have to sit on hold for 45 minutes at 10pm when there is an issue launching a site. GoDaddy has started to show signs of being a bit overburdened by their renewed popularity - hopefully they will get it under control. They also ONLY offer phone support. The other hosting companies have a ticketing system that lets you get on with life (or work, or sleep) while the support team answers your question or solves your problem. GoDaddy adds some GoDaddy tools to the WordPress admin bar. This allows you to flush the cache and access your account easily. For Developers, GoDaddy has a “Pro” plan which allows you to manage your client’s websites from your own Pro Dashboard. Recently, GoDaddy also acquired ManageWP, which is great for managing multiple sites for backups and updates. I was already using this service, so it is nice that all of my GoDaddy clients are now included in ManageWP automatically. Staging is an option on the higher level plan with GoDaddy. The two times I tried it on two different sites it didn't work; after pushing to live my user role was changed to Editor and changing this in the database with phpMyAdmin did not work. Support was not helpful. Although they replicated the problem, they said there was and would not be a ticket to fix it because there were not many reports of the issue. So I had to restore a backup and redo the changes from stating on the live site. Migrating a site to GoDaddy is a fairly smooth process. I have migrated a few sites from a test server to GoDaddy without incident. It does is a straight forward process that does not require pulling a backup zip file from your existing site - just ftp and WordPress credentials. A test of my sample website on GoDaddy shows the price you pay for lower cost hosting. GoDaddy is a “cheap” host. Out of the four hosts I use and which I tested, GoDaddy is the host that many of my clients are already using when they come to me. For those on a very tight budget, their Deluxe Plan is as low as I would go. 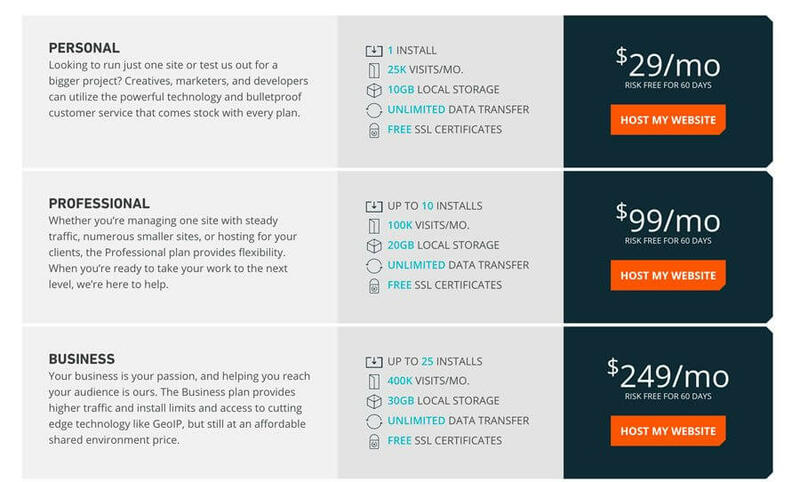 The top tier plan, “Developer” offers staging and after the first year discount is almost the same price as a higher level hosting company (but includes up to 5 installs). I have a lot of websites on SiteGround and have used them for a long time. 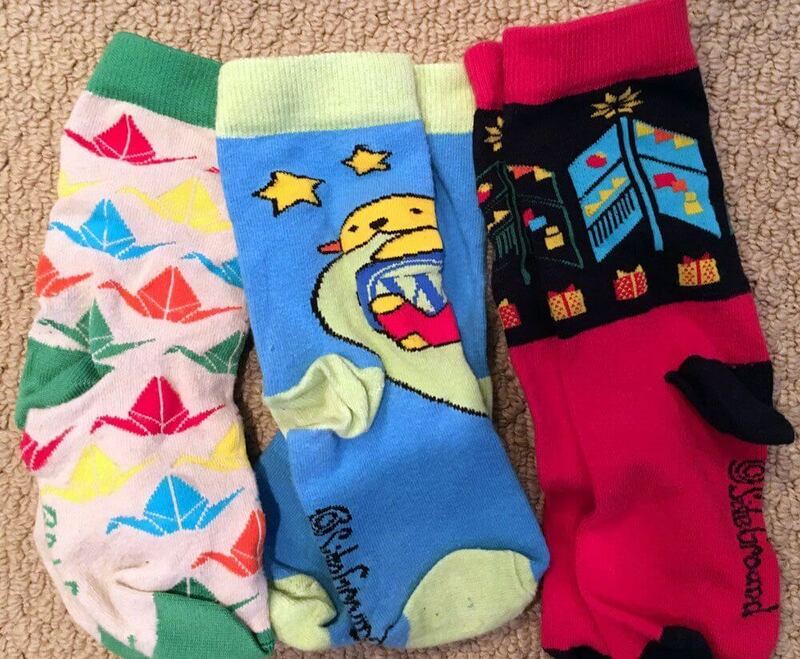 They give away really cool socks at WordCamps! They have a very responsive support ticketing system, as well as live chat and phone support. 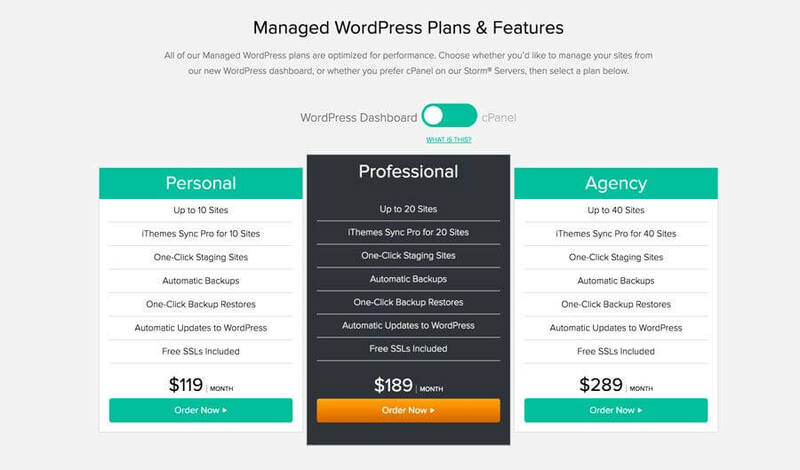 SiteGround’s staging (offered only on the top tier “GoGeek” plan) is listed as “One Click” but it is not as easy as other Managed WordPress staging offerings. Additionally, you cannot overwrite a staging site once it is created. You have to destroy it and recreate it, which is not user-friendly. SiteGround is also the only host on this list that uses cPanel. Some people are used to this and it does have some benefits, like quick and easy access to File Manager without needing to ftp into your site, but it is clunky and old fashioned - there is so much JUNK in the cPanel it is hard to find the two or three things you need. Setting up and managing ftp accounts is not straight forward and to use sftp on SiteGround you need to know how to create SSH keys. SiteGround does not offer any kind of developer dashboard or access, so you need to get your client’s login to access the cPanel or account. If your client only gives you cPanel access, you cannot access Support, as this is not part of cPanel. Migrating a site to SiteGround is also a bit old fashioned. When you set up a new account, you get one free migration. After that, it is $30 to have a migration done for you. You provide either cPanel or ftp and WordPress credentials and they migrate the site for you and let you know when it is done. SiteGround makes this a special Support Request. Site Ground has its own “Optimizer” plugin (formerly it was a “caching” plugin but they have pumped it up). Once installed on your site and configured/enabled within your cPanel, you can clear your cache with a simple click on the link in the WordPress admin toolbar, similar to GoDaddy. This plugin now also offers the ability to change the PHP version to 7.0 and Force SSL from the Plugin's section in the WordPress admin menu. SiteGround has a CPU overage policy that has resulted in a couple of my client’s sites being taken down temporarily. There are daily and monthly limits on CPU usage. Usually, this should not be exceeded, but sometimes a site gets attacked or a plugin causes issues, or something else is going wrong on your site or even with the server. I understand on shared hosting they need to protect all of the sites on a server, but their CPU limit policy is a big negative for me. 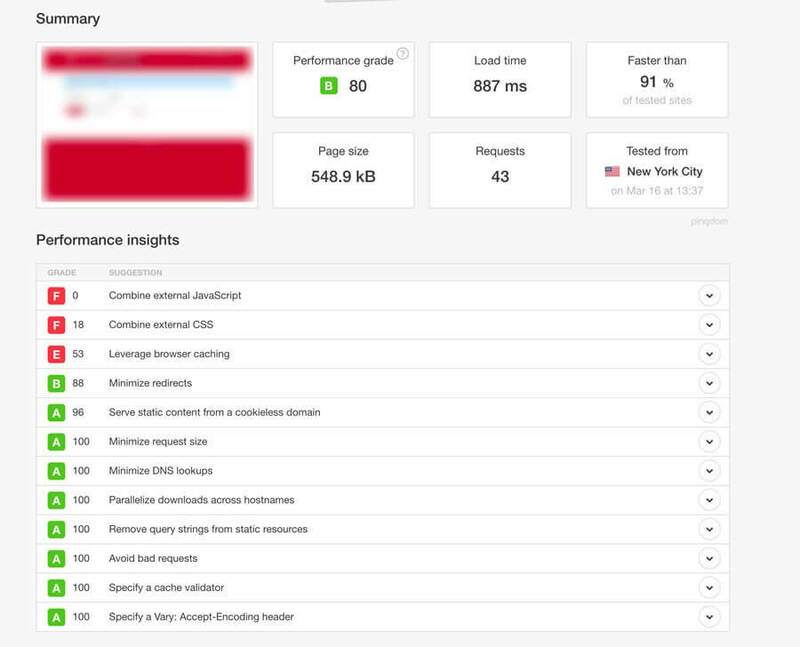 While better than Go Daddy, SiteGround’s performance is not as good as it should be for a pretty lean website. On other sites hosted at SiteGround I found improvements after installing the WPRocket or Autoptimize plugin, adding gzip compression to the .htaccess file and upgrading to Php 7.0 … all things that SiteGround does not offer automatically but can be enabled if you know what you are doing. SiteGround is a bit more expensive than GoDaddy, but the difference is minimal, and for the support and quality of hosting, it is a better value. 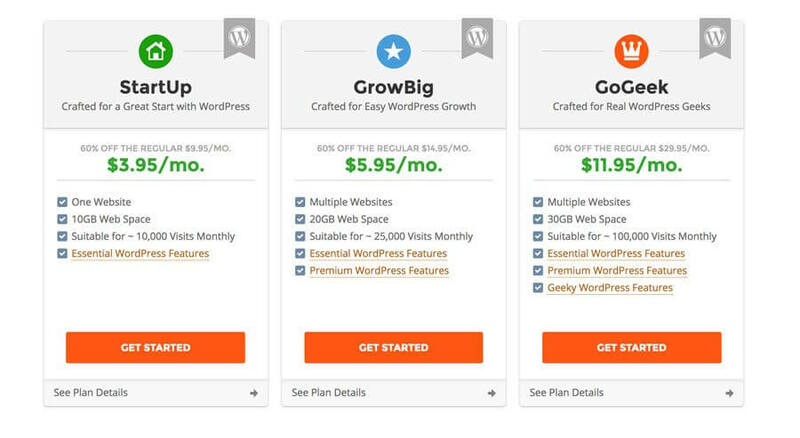 I usually recommend the GrowBig or GoGeek plan (each includes multiple websites/installs), which makes it an even better value, even after the promotional discount, if you or your client have more than one website. I was late to the game coming to WPEngine. I had heard good things, but the price scared me a bit after using GoDaddy and Site Ground for so long. I must admit ... now that I have experienced a hosting company that is designed for WordPress and for WordPress clients, I am a big fan. The User Portal is a little bit confusing at first, as you need to pay attention to which “Install” you are accessing. Once you get used to that, it is very easy to access everything you need - sftp credentials, phpMyAdmin, and Staging. WPEngine shines with its staging. 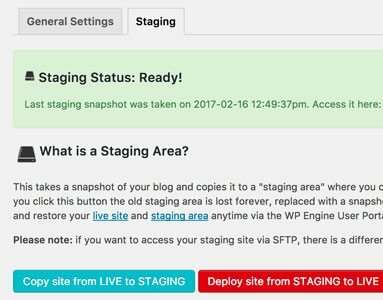 It is so easy to use staging, right from the WordPress dashboard, making it a very accessible tool and an easy way to test things or make changes while not impacting your live site. With one click you can either push or pull your website from live to staging or vice versa. I love this feature. The WPEngine section in the WordPress Dashboard also allows you to fairly easily clear your cache as well. Sites come with PHP7 and gzip compression, and there is lots of stuff happening under the hood to make the site run fast that I don't know (or need/want to know) about. WPEngine support is excellent. They have live chat always available, as well as a ticketing system. Migration is a snap with WPEngine. It is the fastest of all the methods, using a plugin on the originating site and BlogVault to perform the migration, which you can watch progressing as it happens. The information needed by the plugin to initiate the install is very clear in the WPEngine User Portal. For Developers, WPEngine offers free “staging” or “transferrable” installs. You can set up a site on your account and send your client a link to create their own account and then easily transfer the site to their account. This is a great service. 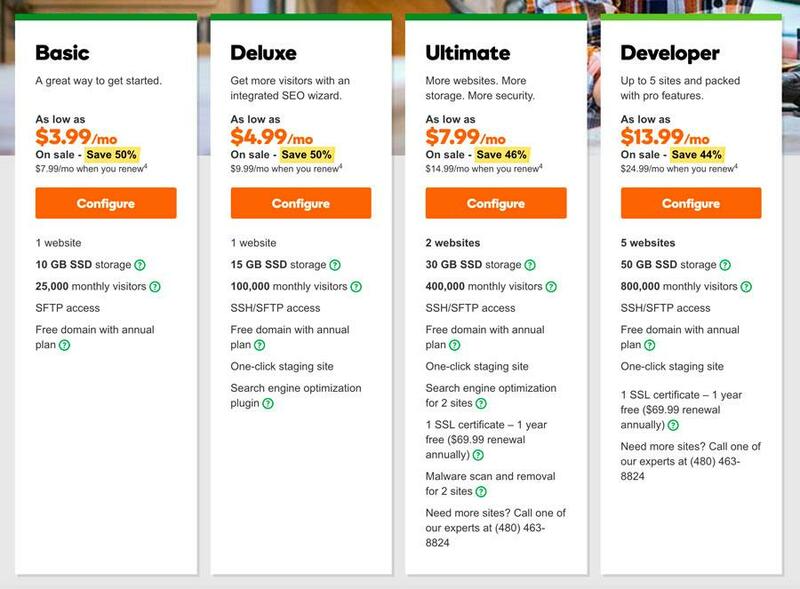 Despite my initial impression, the price for WPEngine is actually not much higher than the higher tier plans at GoDaddy and SiteGround (after introductory discounts). However, if a client has more than one website, the price can become cost prohibitive compared to the others. One thing I am considering, as an agency, is purchasing a Professional or Business account and reselling hosting to my clients. I have shied away from this practice, but because WPEngine does allow you to grant access to others in the User Portal, and because their results are so excellent, I may finally suggest that some of my clients move their hosting to my WPEngine account. I can charge them less than $29 per month and still cover my cost, as long as I have enough clients participating. While Liquid Web has been around for many years, they are relatively new to the Managed WordPress space, and are making some big inroads here. Their focus is “Mission Critical” sites, which refers to websites that are primary income drivers for a business. While this does not apply to many of my current clients, it is a focus I want more clients to have. With the addition of Chris Lema to the team at Liquid Web, I am excited to see what is coming. Already, they have started adding some great features like (optional) automatic plugin updates that they perform after doing a visual comparison of your website pages before and after an update to ensure nothing is broken. This is pretty neat! They are also adding a premium image optimizer to their arsenal, as well as iThemes Sync, which is similar to ManageWP, allowing management of multiple websites from one dashboard (so not really a benefit for others like me who have a large number of sites already in that system). All sites automatically get an SSL and are set to HTTPS which is smart, and new sites use PHP7. Support has been very good, with the exception that an extra step is added when you use the live chat, you have to be transferred to their Managed WordPress team. Tickets are responded to quickly and their ticketing system is thorough. 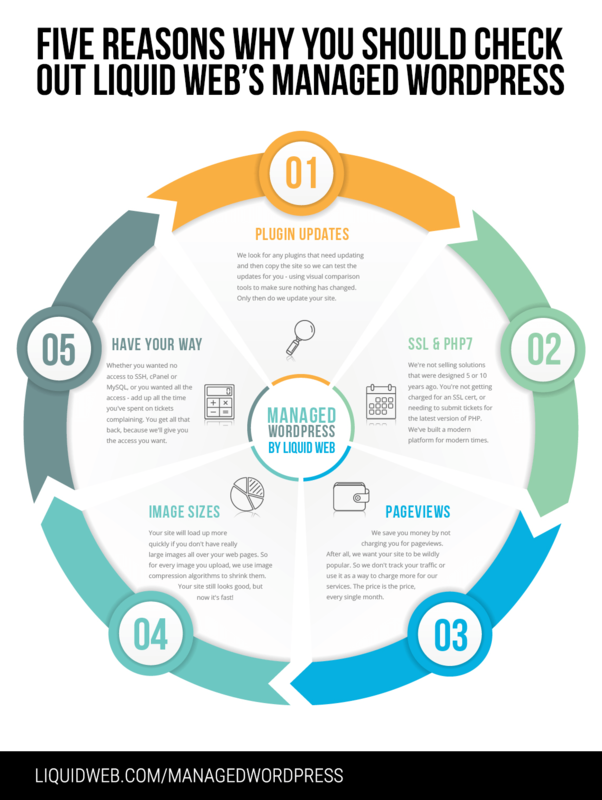 Liquid Web's migration process is the same as WPEngine - using Blog Vault via a plugin installed on the originating site. In my test, the Liquid Web migration took quite a bit longer (a couple of hours) than WPEngine, but was easy. For Developers, Liquid Web has something they are calling “Stencils,” which is like a starter template you can use as a draft for implementing future sites. I haven't tried this yet, but it seems like a great tool. Staging is only one way (live to staging), which seems like something they will be changing but right now makes it a bit pointless since you have to manually redo your changes or use a plugin like WPMigrate DB Pro and sftp. 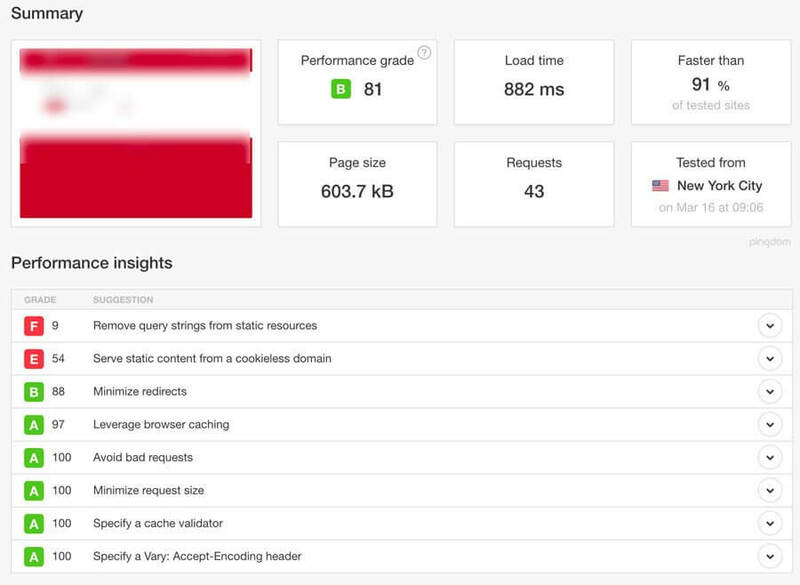 Liquid Web is pretty comparable to WPEngine on speed and performance, with browser caching being the only area where they get a lower/failing grade - although this does not seem to affect the speed, at least on my sample site. I have heard that Liquid Web will be using Varnish in the very near future, which should improve speed/performance even more. Liquid Web is clearly going after a higher level of client. Their focus on “Mission Critical Websites” means those who are willing to spend more for high quality service and support. I am testing Liquid Web to see what they do, and when/if I decide to purchase a plan and resell to some clients, it may be a hard choice between WPEngine and Liquid Web. * Cost could be fine if you are an agency/developer willing to resell hosting on a plan with multiple installs. Feel free to comment here if you have similar experiences with these hosts, or if you have more to add to these reviews!